Lease terms, when written properly, can be leveraged to protect a landlord’s interests. It is important to ensure that any lease that you propose to prospective tenants shield you from certain risks. Here’s a look at several common commercial lease provisions that protect landlords. Most business entities legally shield owners from personal liability for the debts of the business. However, this doesn’t preclude you from adding a separate personal guaranty to lease terms. Such a provision would make individuals liable for any financial obligations that the business entity could not fulfill relative to the lease. It also encourages those guarantors to be more involved in ensuring the success of the business and avoiding default. Lease pricing and other terms may be based on a specific use of a leased space. Some uses can cause much more wear and tear or consume more utilities than others. Thus, landlords should protect themselves by spelling out those use limitations in the lease. This will prevent changes by tenants that could adversely affect a property and a landlord’s finances. Assignment and subletting should also be restricted to protect a landlord’s interests. Leaving these options open-ended would simply be too risky as landlords would relinquish control over who occupies the space. There are many ways to structure assignment and submitting provisions to protect landlords while still granting tenants some flexibility. It may seem obvious that tenants should carry insurance, but the types and selected coverages often vary. Landlords should specifically outline required coverages and policy limits. This helps to mitigate the landlord’s liabilities. For instance, if a patron is injured while visiting a tenant’s facility and the tenant lacks proper insurance coverage, the patron is likely to pursue the landlord for damages. Requiring insurance is among the many commercial lease provisions that protect landlords and tenants. What happens when a tenant is no longer able to pay rent? What recourse is available to the landlord and to the tenant? Can the landlord repossess the property? Can a landlord’s related expenses be recovered? Can the space be leased to a new tenant? The lease must detail those specifics in order to preserve a landlord’s rights. The above contains only a few primary examples of commercial lease provisions that protect landlords. Based on the property, potential tenant, and other circumstances, there may be many other terms and restrictions to consider. 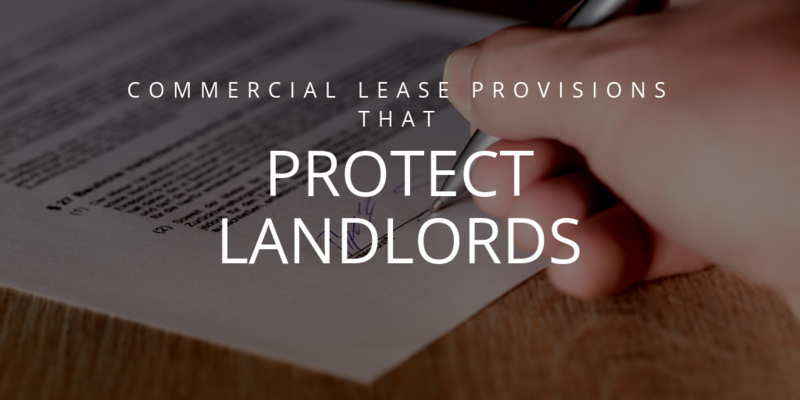 Be sure to work with experienced professionals when negotiating commercial leases to protect your rights and minimize your liabilities as a landlord.